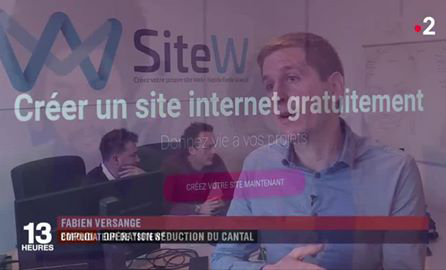 SiteW is an online service allowing everybody to create and to manage their website without any technical knowledge! Small and medium-sized enterprises, private individuals, communities and associations use our service to spread their news, to show their products and to promote their services online. The SiteW web design tools allow you to easily build a website that perfectly suits you. With a single click, you have your online website. The SiteW online service allows you to update your website at your convenience wherever you are: you just need internet connexion. The SiteW commitment is that your website will be ad-free, even if you have a free website! A specific request, a question? Get a quick and tailored answer: our team would be happy to help you. Thanks to this efficient and individualized support, SiteW is the website builder best evaluated by users (9.5/10) on the independent platform Trustpilot. SiteW offers a free package allowing everybody to create a showcase website without any cost and deadline. Two additional offers are available for professional website creation and e-commerce. These packages are aimed at serving in the best way possible the different needs of our mixed customers. SITEW.COM is an online service allowing everybody to create and to manage their website without any technical knowledge. Right from the beginning of the company, the SiteW founders have chosen to set up shop in a rural area. In a village located in Cantal where 500 inhabitants live, surrounded by a soothing green setting and nice colleagues, the small highly motivated team finds a peaceful place, ideal for creativity and productivity. Within the company, SiteW uses the ‘Agile’ methodology to organize and to divide up tasks. Following consultation, the SiteW team takes decisions thus, contributing to a decentralized, creative and collaborative management. Journalists often get in touch with SiteW to share our incredible venture. In order to know who we are and our story, see our press kit or our press review. L'implantation rurale n'empêche pas la start-up de se développer avec succès, y compris à l'étranger. Aujourd'hui, SiteW ne couvre pas moins de 216 pays. Un million et demi de sites ont été créés depuis la naissance de SiteW. Partie à la conquête du marché hispanophone, la start-up ambitionne désormais de se déployer au Maghreb. 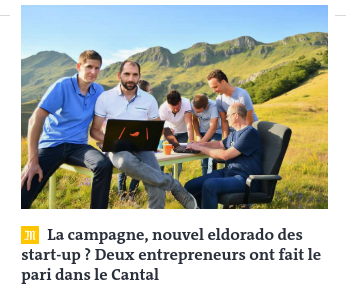 Zoom sur le Cantal, sur SiteW, et sur Philippe, ingénieur ayant choisi de quitter la grande ville pour rejoindre la startup et vivre à la campagne. Un changement de vie réussi, et un message à faire passer : un job passionnant, une entreprise innovante, et une vie au contact de la nature, c'est possible ! 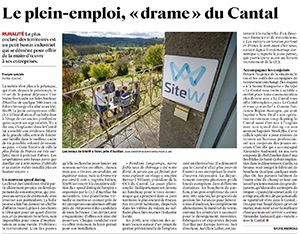 Le Cantal est un petit bassin industriel qui se démène pour offrir de la main-d'oeuvre à ses entreprises et un projet de vie à ses nouveaux arrivants. 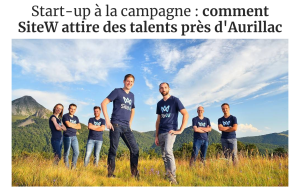 Pour Fabien Versange, co-fondateur et dirigeant de SiteW, s'implanter dans le Cantal il y a 10 ans lui a semblé une évidence. Depuis, la start-up ne cesse de se développer en France et à l'étranger et souhaite recruter un ingénieur en informatique. Help us make website creation even more accessible! Go to our Press section to get more useful information.